This simple and sweet princess design says I am a girly girl. This royal pattern is made with a beautiful and versatile pink and white diamond pattern. The little princess, dressed in various shades of pink, is wearing a coordinating purple crown and hair tie. 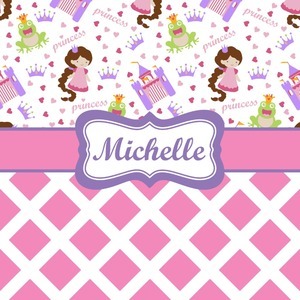 A wide pink band trimmed in purple pull the pattern together and help to showcase the personalized princess in a circle label.